THE WHEEL OF SEGAIS can be used to plot the paths and cycles, of your business, your projects, your relationships, and your life through the four stages of Initiation, Emergence, Maturation and Manifestation (Winter, Spring, Summer and Autumn). 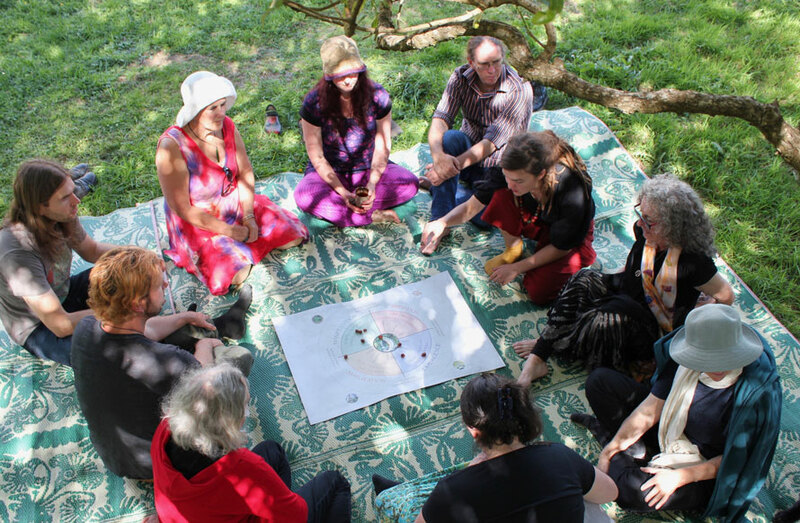 In New Zealand I run one-day facilitated workshops for up to 20 people and also run ongoing monthly courses following the 12 streams that flow from the Well of Segais: Transformation, Openness, Affinity, Passion, Commitment, Alignment, Identity, Discrimination, Ripening, Healing, Harvest and Reflection. The next one-day (10am-4pm) workshop will be on Sunday 2nd June 2019 here at The Woolshed and from there I will ascertain when is the best time to begin another series of monthly workshops. These will be in addition to the Reader training although they will use much of the same material. I am also exploring the possibility of making these monthly workshops available online for those of you in other countries or out of town. I will be travelling to Australia in April 2020 and the UK and Europe in May / June 2020 and I am keen to run one-day Wheel of Segais workshops. If you would be interested in attending one of these please register your interest. If you would like to organise a one-day workshop for me (promotion, venue, admin, etc.) then I would be happy to offer you a place for free. The ELEMENTAL PROCESS or CYCLE OF THE SEASONS can help us understand the INNATE NATURE or CYCLE of ALL THINGS – A PROJECT, A RELATIONSHIP, A BUSINESS, A LIFE and thus give us tools to ENHANCE or IMPROVE and SUPPORT the inevitable CYCLE OF CHANGE. Even the seasons form a great circle in their changing, and always come back again to where they were. The life of humankind is a circle from childhood to childhood and so it is in everything where power moves. Our tepees were round like the nest of birds, and these were always set in a circle, the nation’s hoop. The understanding of Cycles and Elements is profound and universal – a process that informs all scenarios – relationships, projects, business, personal – daily, yearly, a lifetime. It is a way of describing the world and ourselves found in the wisdom of the great philosophers and teachers worldwide. The Druids, as with other ancient cultures, used their observations and understanding of the planting cycle and the cycle of the seasons to offer wise counsel on the correct order of all things. The time of INITIATION (Fire), of Potential and Possibility, of Beginnings. The SEED beneath the winter soil is excited by the spark of life, promising what is to come. The time of EMERGENCE (Water). The passion for growth is nurtured by the warming SPRING RAIN. The time of MATURATION (Air). Under the harsh glare of the summer sun, the plant’s abundance requires some discipline and structure, laterals are pinched out and a TRELLIS is erected, to ensure the best possible harvest (outcome). The time of MANIFESTATION (Autumn). A time of completion, of HARVEST. A time of satisfaction and reflection. And the cycle goes on – we can choose DECAY or GENESIS – an ending or the planting of a new Seed. All projects start with initiative, idea, potential, big picture (Fire). The idea then needs some support and nurturing (Water) in order to discover its potential and help it grow. When it is ready, the project/idea must be given structure and subjected to intellectual rigour (Air) to make sure it can mature and, finally, it must be practically completed (Earth). Unfortunately, in our western society, we almost always leave out water (nurture) and go straight to intellectual rigour before the poor idea has had a chance to be fed or, even worse, we go straight from fire to earth, i.e. from idea to ‘do it’! THE WHEEL OF SEGAIS is an invaluable tool for supporting and managing the Cycle of Change and for creating Effective Teams. We hear people talking about ‘being in their element’ or, ‘it’s in their nature’ or ‘not in their nature’ or, ‘it’s their temperament’. An understanding of DIFFERENT PERSONALITIES or TEMPERAMENTS (our own included) and the ‘personality’ of an organisation or business helps us improve communication, create effective teams, and oils the wheels of the cycle of change to satisfactory completion. THE WHEEL OF SEGAIS / FOUR SEASONS / FOUR ELEMENTS training focuses on CONTRIBUTION and APPRECIATION – the contribution, gifts and talents of others as well as our own so that we may appreciate how necessary diversity and difference is to the whole. Each of us has a primary or ‘elemental’ mode of being. This doesn’t mean we aren’t capable of operating in other elements but that each of us makes our major contribution in one of the four elements – Fire, Water, Air or Earth. As a film and television producer for many years I have used this understanding in making films with some very big crews and cast. If the crew isn’t working smoothly I’ll go looking for the element (the person) that is missing (usually water, often air) and I will also examine the process to make sure that each step has been given its right time and place. I use THE WHEEL OF SEGAIS as a way to understand the cycle of all things be it a project, an intention, a life, a relationship, a business, etc. As well as doing personal sessions, I run monthly ‘Wheel’ workshops here in New Zealand. The students at these workshops are learning to plot the paths, the cycles, of their projects, their relationships, their lives, through the four (inevitable) stages of Initiation, Emergence, Maturation and Manifestation.